Time’s limited. Why not skip the ferry line and get right to the enjoyment? Admit it, this winter has been tough on your relationship. The long rainy months have made you feel like hibernating, and your love life has become a little bit stagnant. With Valentine’s Day in the rearview mirror and warm weather still ages away, it means you need to jump-start your romantic life. And the best way to do that is with an escape. Sure, you could try to conjure a spark at home. But another weekend on the couch eating cold pizza and watching television isn’t going to cut it. You need a shock-and-awe strategy: shock your partner with a surprise vacation and awe them with your romantic spirit. Less than two hours north of Seattle, the Puget Sound coastal waterways are surefire bet for romance this time of year. Ever noticed how swoony people get when they’re around the water? It’s like jumper cables to the soul. Imagine dramatic tree-studded coastline, sipping a glass of chardonnay with the golden rays of a sunset bouncing off the water. On cue, a bald eagle swoops low overhead. You could head to the San Juan Islands – they’re a classic Washington destination, but you don’t have that much time. Here’s a pro romance tip for you: skip the ferries and stay on the mainland instead. Nothing kills romance faster than a ferry line. During a weekend away, you want to get there fast. The Bellingham area is the perfect alternative to the San Juans. You experience the same stunning views, the same serene atmosphere, the same emerald water plus all the benefits of a small urban center nearby – minus the ferry hassle. Romantic drive – The winding Chuckanut Drive just south of Bellingham weaves through forested glades, popping out to cliffside viewpoints with inspiring Puget Sound vistas. You can take short walks and explore secluded pocket beaches or simply gawk at the panoramas. Step back in time – Fairhaven Village is a charming historic district founded in the late 1880s. It became part of Bellingham shortly afterward. It bustles with shops, galleries and restaurants that invite strolling hand-in-hand, browsing, and sharing discoveries. Chocolate tasting – Chocolate Necessities is one of the oldest artisan chocolate companies in the U.S., serving creamy truffles dipped in Couveture chocolate imported from Belgium. They’re guaranteed to warm anyone’s heart, especially when paired with a steamy mug of drinking chocolate. Sensory deprivation float – You’ll never find relaxation quite like a 60-minute float in a sensory deprivation chamber at Still Life Massage. Once inside your futuristic pod, the outside world melts away. You’ll float in a warm saltwater solution and experience a level of peace you never knew was possible. Oyster picnic – Take a trip to Taylor Shellfish Farm on Chuckanut Drive and buy some fresh local oysters (they’re in season!). Barbeque them in-shell next to your table and create your personal picnic overlooking Samish Bay. An essential ingredient to any romantic escape is your hotel. If your room is stunning, almost nothing else will matter. Here’s another pro romance tip: skip the mega hotels and book a stay at a boutique location like Bellingham’s Hotel Bellwether. It’s a guaranteed romance-achieved mic drop. Every suite has a fireplace and jetted soaker tub. You can schedule a couple’s in-room massage. Watch the sunset right from your bed and order gourmet room service from the on-site restaurant. 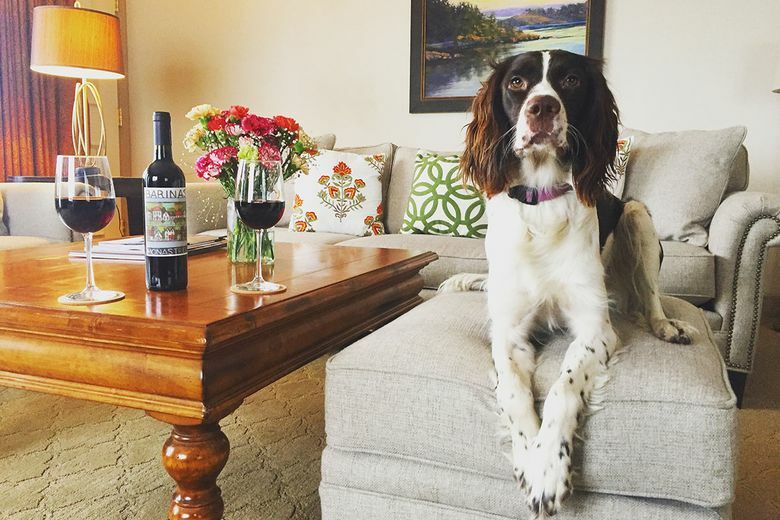 While you could happily spend the entire weekend without leaving your room, when you feel like stretching your legs, the hotel has a French spaniel named Bella who would be happy to lead you on a walk around the marina and nearby waterfront trails. Sure-fire romance is easy, and it’s less than two hours away! 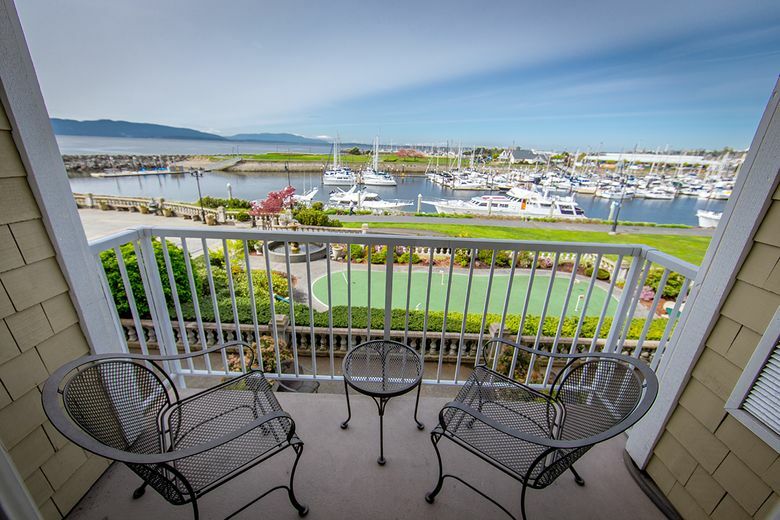 The Hotel Bellwether is set on the edge of pristine Bellingham Bay and is one of the top luxury hotels in the Pacific Northwest – recently voted the No. 1 Luxury Hotel on “Evening Magazine” Best of the Northwest.